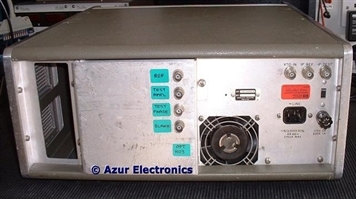 The HP 8407A Network Analyser mainframe operates from 100kHz to 110MHz. 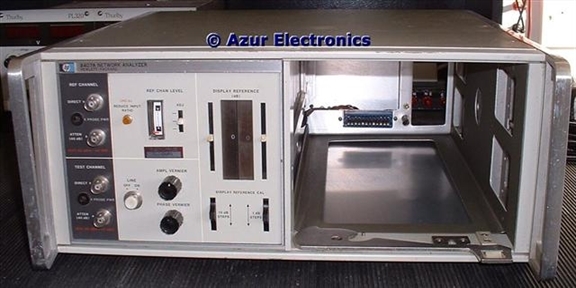 With a plug-in Display Unit (8412B, 8413A or 8414A) and a carrier wave or swept frequency source (8601A), this 2 input tracking receiver measures the amplitude and phase ratio of RF signals. The original cost was $5,350 in 1980. A HP Manual was downloaded from the Web. 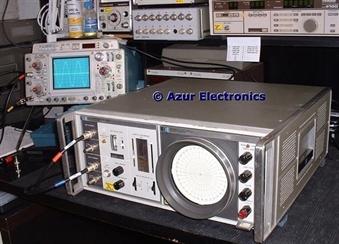 Very useful reference sources are HP Application Notes 121-1 "Network Analysis With The HP 8407A 0.1 - 110 MHz" and 121-2 "Swept Impedance With The 8407A Network Analyzer 0.1 - 110 MHz". 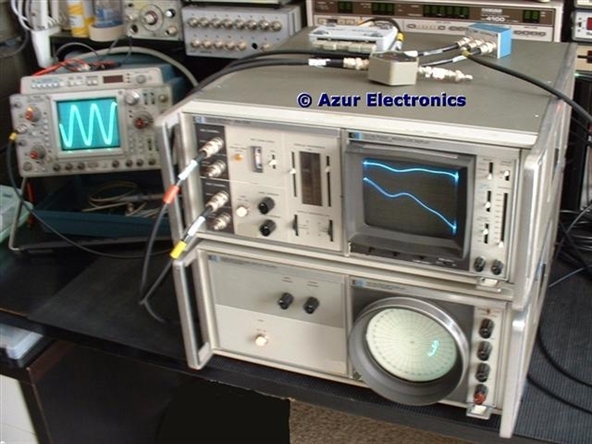 * IF REF & IF TEST are at the same point in the circuit as the inputs to the plug-ins, so these outputs are a useful monitoring point for an oscilloscope to show the amplitude and phase difference between the signals. Bought the 8407A (S/N 1317A) on eBay UK together with a 8412B. The Network Analyser was completely stripped down, cleaned up, a few minor faults repaired and re-assembled. The Display Reference indicator is unusual as it uses a printed film strip which has become tarnished over the years and is somewhat fragile. This makes it a bit difficult to read but I decided not to attempt cleaning in case it wiped the data. 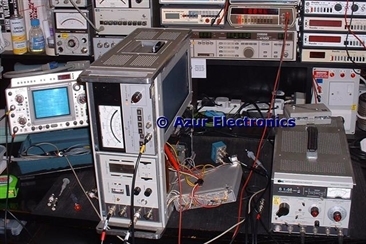 Testing is held up as it needs a HP 8601A Generator/Sweeper which provides the RF and VTO signals required. 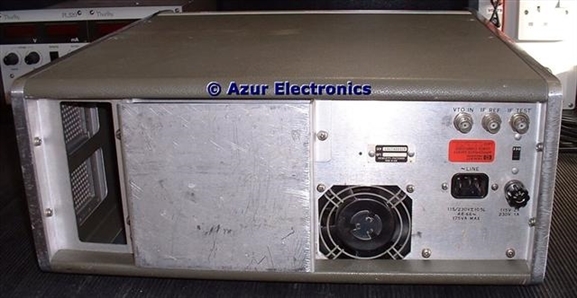 After 3 years delay, the HP 8601A Generator Sweeper has been acquired, repaired and tested. 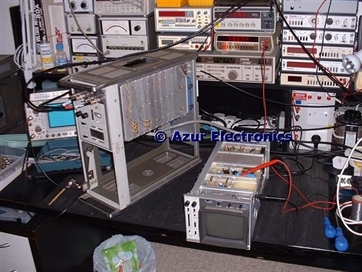 Started testing the 8407A using the 'Transmission Test Setup" and the HP 8413A Phase - Gain Indicator which is the most basic of the 3 Plug-In's. Alignment Procedures carried out and some adjustments required to get the Generator and Network Analyser in phase-lock. Started testing the 8407A using the 'Transmission Test Setup" and the HP 8412B Phase - Magnitude Display. WARNING: with the covers removed on the 8412B, 3kV high voltage is exposed. Alignment Procedures carried out and some adjustments required to get the Display operating correctly. Completed the 8407A Troubleshooting Tree, Adjustments and Performance Tests. Mostly ok but a few minor issues with the phase-locked loop and adjustments 6 & 7 which will need some more work when I have time, or if they cause any problems. NOTE: It is essential to ensure that the 8407A is phase-locked to the 8601A. The REF CHAN LEVEL Meter needs to be in the OPERATE zone. Also, it is a good idea to monitor the IF REF & TEST outputs on an Oscilloscope to ensure the 278kHz signals are phase-locked. Tested the 8407A with the HP 8414A Polar Display. One is tested ok, the other is faulty and will be kept as a maintenance spare. 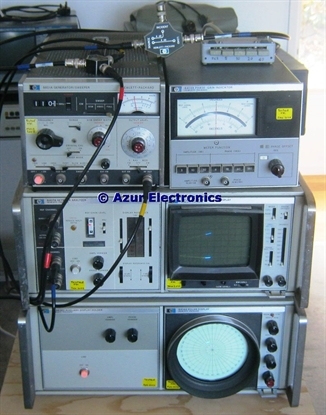 This Network Analyser with the 3 Plug-In Displays is a fairly complex system to operate, see Operating HP 8407A Network Analyser for more information. Using the HP 8407A with the HP 8418A Auxiliary Display Holder provides the opportunity to have 2 Display Units working at the same time. To achieve this, the 8407A needs to be modified. This was Option H03 and provided 4 additional BNC outputs: REF; TEST AMPL; TEST PHASE; & BLANK to drive the 8418A. 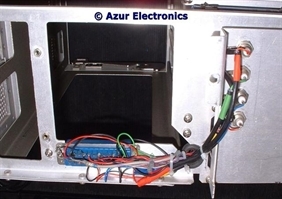 These outputs are wired in parallel to the same outputs to the Display Units. 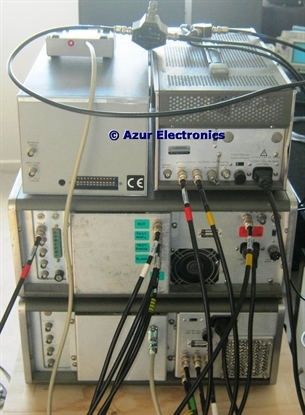 See Network Analyser Interconnections for details. 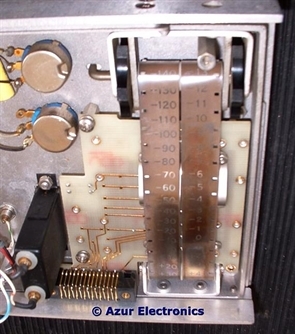 After repairing a tricky fault in the 8407A, in a feedback loop affecting several sub-assemblies, re-checked the entire system. I now have all the equipment on top of a mobile cupboard which makes it easy to wheel up to my bench when required. Plus access to the rear cabling and connectors are facilitated.